When an employer is looking to hire a new employee, they are looking for the most cost-effective candidate. This does NOT MEAN the candidate with the most years of experience, the highest educated candidate or the person they can hire at the lowest salary. Instead they are looking for someone to fulfill a need that they have or solve a problem they are experiencing. You MUST communicate your value, your benefits and your return on investment (ROI) to each employer. IDENTIFY MEASURABLE EXAMPLES OF YOUR VALUE – For each of your value statements, you should be able to think of two to three examples of how you used these skills to make a contribution during your career. Whenever possible, add a measurable value to help your future employer understand the scope of your contribution. Whether it is the number of people, a percentage of efficiency improvement or a dollar amount of cost savings, these numbers will validate your worth. 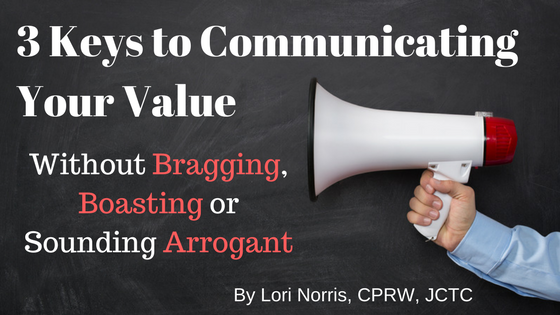 By backing up your skills with examples, stories and facts you will not be perceived as bragging. Instead, you will simply be stating how you can enhance the company and its customers if given the opportunity. Using the earlier production manager example, you can say “I led teams of 300 technicians to prioritize, schedule and complete more than 10,000 annual maintenance tasks with a 98% on-time completion rate while averaging a 96% quality assurance pass rate.” This past example of your success shows where you excel and demonstrates measureable value. LEARN TO COMMUNICATE WITH CONFIDENCE – Before we talk about how to communicate with confidence, let’s explore the difference between confidence and arrogance. Confidence for a job seeker demonstrates competence and professionalism and has the ability to inspire a hiring manager to add you to their team. Arrogance, on the other hand, is off-putting, makes people uncomfortable, and often motivates the hiring manager to show you the door. Confident people sell themselves as a potential solution, they don’t arrogantly brag that they are the only solution. The confident job seeker takes the time to research the company’s needs and problems and presents their relevant skills and accomplishments in terms of how they could potentially benefit the employer. I hope these strategies help you to overcome your fears of boasting or sounding arrogant when you talk about yourself in the job search. An important first step is to take the focus off of you and instead make every statement about how you can help your future employer. 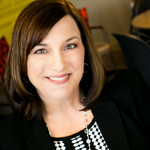 In case we’ve never met, my name is Lori Norris, the founder of Veteran Transition Network and Get Results Career Services. I have helped thousands of job seekers create compelling resumes, cover letters, LinkedIn profiles and job search strategies that help them get the results they desire. I have dedicated my career since 2005 to educating and assisting veterans during their transition out of the military. If there is a subject you would like to know more about, please leave me a comment below and I will do my best to address it in the near future for you.Before we dive into HOW to sell yourself in the job search, let me clearly communicate the IMPORTANCE of communicating your value in the job search. Whether you are writing your resume, preparing a compelling LinkedIn profile or answering questions in an interview, YOU are the best person to sell yourself as the right candidate for a job! Don’t expect a potential employer to take extra time to figure out how you can benefit them – you must clearly communicate what YOU can do for THEM.